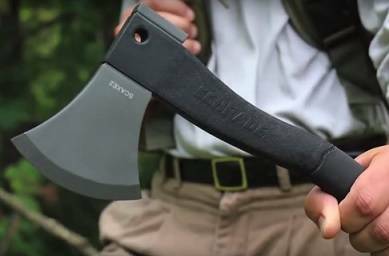 Are you looking for a survival axe that is both sleek and practical? 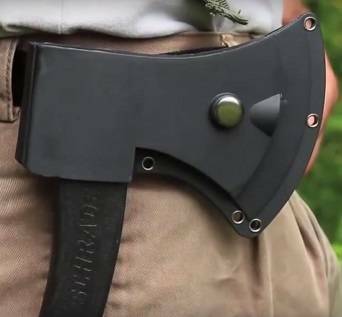 Then the SCAXE2L Survival Hatchet by Schrade might be it. This hatchet is a lightweight, durable, versatile tool that will come useful with both outdoor survival tasks and everyday chores. It features a hardened blade that is coated with a corrosion resistant titanium finish, an ergonomic handle with comfortable TPR rubber grip, along with a heavy-duty pommel on the back of the head. It weighs just under two pounds and includes a sheath that keeps both the user and blade safe while giving you a convenient method of carry. Additionally, a limited lifetime warranty, an extra long Ferro rod and a sharpening stone are included with your purchase. This excellent tool is designed to be used in extreme conditions, and can stand up to tough jobs. Ideal for avid campers, outdoor enthusiasts, and even for on the job! The Schrade SCAXE2L is a great addition to a camping pack or toolkit, as it offers a ton of excellent features as well as reliability. Created by the world-renowned weapons and tool producers Taylor Brands LLC, this hatchet does not compromise quality for style. It comes fully loaded with a 4″ stainless steel blade finished with a titanium 3Cr13, an ergonomic glass reinforced nylon handle with TPR rubber grip, and a hardened pommel on the back. Along with that, Schrade throws in a Velcro closure nylon handle with a belt loop, a flint rod that secures snugly into the handle, and a double-sided sharpening stone. 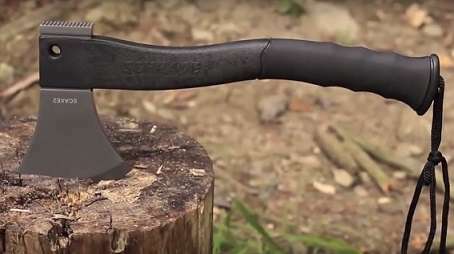 The axe itself has great chopping power, and the hammerhead on the back is perfect for driving in nails, tent stakes, breaking down a glass, or even hacking away dead branches. Now, the steel might roll or chip when tackling tougher woods but Schrade makes up for this by including a sharpening stone. It’s an easy fix, but it can be frustrating if you don’t have the tools readily available. 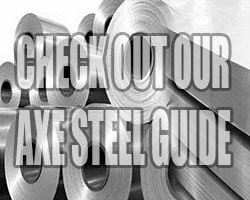 The fire steel that is included is useful, functional, and truly an excellent feature. The rubber tip ensures that it stays safely embedded in the handle when not in use, and has a helpful string that hangs out of the handle for easy removal. The nylon sheath gives you the option to carry it on your belt, though, at roughly 2 pounds, it can be a little much to carry on long trips. If you wish to take it on a long excursion, it is recommended that you carry it in a pack. Another really beneficial feature is the ergonomic handle. The rubber grip is not only comfortable but also features finger grooves to give you a relaxed but secure grip. Plus, the curved shape fits nicely in your grasp and also makes sure the hatchet doesn’t fly out of your hand when using. Schrade has made a great tool here. The SCAXE2L will come in handy for brushwork, tent building, constructing shelter, clearing out dead trees, and more! The thick titanium layered head combined with the rust-resistant 3Cr13 coating really gives the steel a durable finish. Along with the included fire steel and sharpening stone, you’ve got a great tool for less than $50! It’s definitely worth the purchase. Just keep in mind you will be using that sharpening stone plenty to keep it in tip-top shape. Despite that, the tool stands up to tough weather conditions, and the handle design is not only aesthetically appealing, but also functional and gives you a really sturdy grip when using. All in all, I definitely recommend this tool. It’s affordable, it’s durable, it’s practical, and it’s powerful. Plus it’s backed by the a limited lifetime warranty by Schrade along with the insurmountable reputation of Taylor Brands, which has been producing top-of-the-line weapons, gear, and survival tools since 1975. The axe is a bit on the heavy side if you need something to take with you while hiking, hunting, or on long treks, but it’s perfect for car camping or for using in the backyard and around the house.